Platimiro Fiorenza, born in Trapani in 1944, has been considered by many a living monument. He is more than just a craftsman: he is the last of the master goldsmiths and coral artisans, heritage of a unique craft knowledge. 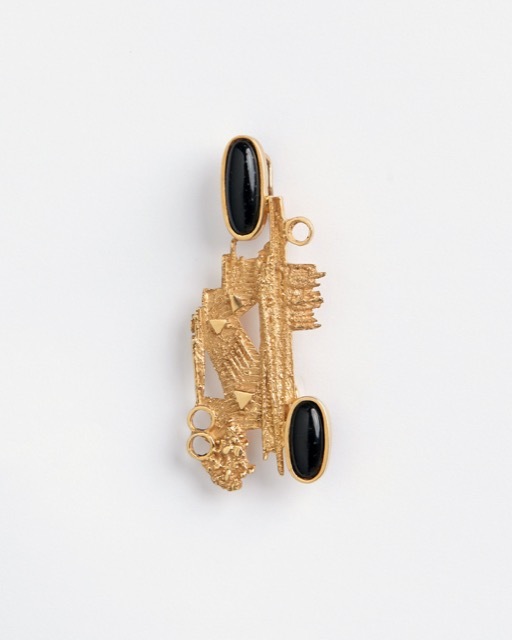 During his career, Platimiro accomplished restoration works for some of the most famous antique dealers, made jewelry to order and important sacred art objects, one of which is “Madonna di Trapani” showed in the Vatican Museum. Unesco has recognized his contribution to the Italian craftsmanship panorama by including him in “The book of the Living Humans Treasures”. Extremely significant for his education it was the period between the 60’s and the 70’ spent in Milan as assistant of the great sculptor Giò Pomodoro. This collaboration well influenced part of his goldsmith production, where the newest design perfectly marries his ancient handcraft tradition. 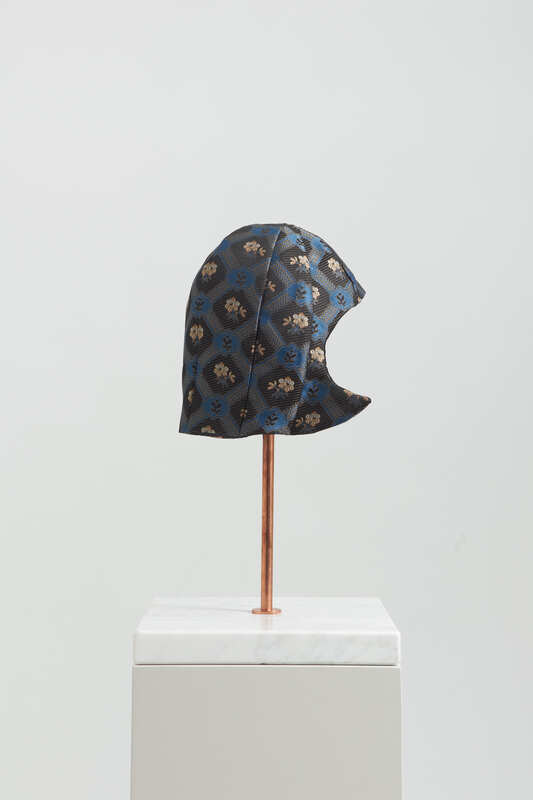 Genevieve Xhaet, founder of the headwear brand Flapper, always sensitive and curious about art and craft trends, has been fascinated by Platimiro Fiorenza’s work. She decided to start a collaboration with him and conceive a special capsule collection for next season. Working together, inside of Platimiro’s Sicilian atelier, they rediscovered precious sketches draft during his Milanese period. Two jewellery shapes were than created and joined to the iconic Flapper hats “Antea” and “Genoveffa”. 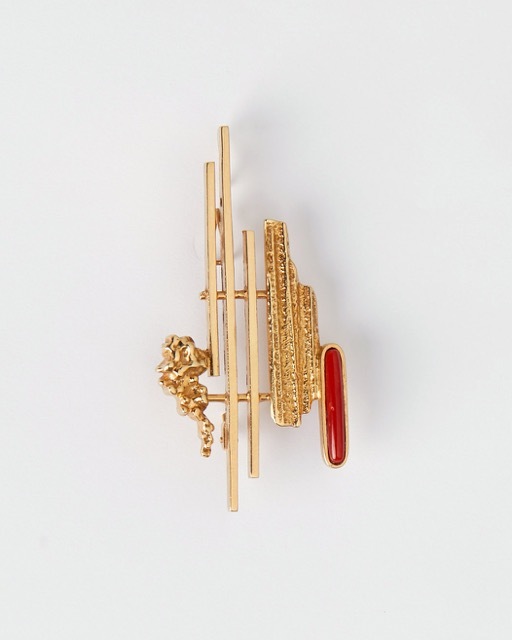 These are valuable accessories exclusively designed for lending a new allure to the Flapper headwear, unique for their versatility, perfect as earrings or brooches, realized with authentic Sicilian corals, red or black. Continuing the collaboration series started with Alessandro Agudio in 2017, FLAPPER is delighted to present the Claque&Shill project, co-designed with AndreaRomano. The artist selected three amongst the most iconic FLAPPER models of2019 SS season developing a limited edition. Applying traditional tailoring techniques and sophisticated research on textiles and materials, FLAPPER captures the evolution of female tendencies, anticipating their unconscious wishes. 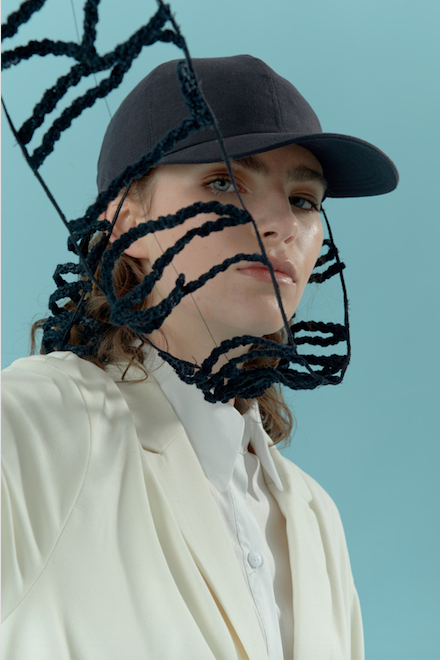 Among these, a counter-trend reflex rises: to cover oneself up, in order to create suspense in the potential of revealing oneself again: hats with veils, wide brim and visors, long fitted bands enrich this forthcoming series of creations. From the artist’s perspective these additional membranes – distinctive of hat models Alba, Antea and Titania – become his filters, his medium to show private and collective thoughts: they become masks made of words suspended between the wearer and his viewer. Andrea Romano (Milan, 1984) observes the city that creates and destroys its myths: he has been always interested in decoding the invisible laws that rule social relationships, the images and languages that build and influence consensus, as well as the artwork’s boundaries in relation to its space and to its audience. Claque&Shill not only titles the artist’s solo show debut (2011), but it is also a wide macro-title that includes many artwork series, amongst which famous 2011-1018group of portraits made in graphite and sanguine. Seductive and impervious girls are the subject of these Claque&Shill drawings:apparently perfect representation of feminine in which a subtle thorn lies, with the ability of subverting the placid consensus of the audience. Subliminal communication deeply influences human relationships: unconsciously or not, people play ambiguous roles daily, acting in a never-ending so called “MedicineShow” - in which the performers, in addition to dancing and singing, were used to persuading the audience to buy improbable elixir. On the occasion of this artistic collaboration with Flapper, Romano selected some of his textual artworks and isolated some of his artworks’s titles from the pieces they refer to, as if they were suspended and independent sentences. They recall words the audience was not supposed to catch, working as private exchange between the director/artist and his portrayed actors/subjects portrayed, his hidden claque in the public, and his charlatan on duty. Precisely these three lines of subtext have been collected and developed until they acquired their thickness: made of black cotton wire, accurately crochet manufactured, these textual artworks have slowly trespass from the sheet of paper to the surrounding space. As defined by Andrea Romano, “they are collages of experiences that, once attached to the heads, become public reflections on our own role within the context, visible thoughts concerning to the act of observing and being observed”. CHROME X is a Flapper project made in collaboration with the Italian artist Alessandro Agudio. Over the course of 2017 three different turbans in silk have been developed: each gradient printed on fabric was developed starting from a photograph of the eye’s iris of three women. Three special icons of contemporary culture: design gallerist Luisa Delle Piane, artist Goshka Macuga, and fencer Nathalie Moellhausen - were invited to participate by providing a high-resolution image of their irides. Rather than being dedicated to them, the CHROME X project is dedicated right to their own DNA, their unique codex of feminine, unconventional attitude and energy. From 2015, Alessandro Agudio carries on an artistic research entitled ‘Chrome - Details of Enlargements and Elaborations of Portions of the Human Eye’s Iris’: an image-masters archive obtained from the digital elaboration and enlargement of a close-up of a human eye. His research began focusing on furnishing the entire private spaces of a person, who can customize objects and his environment with the tone of his or her own iris, and constantly see himself or herself reflected in the space he or she lives in. 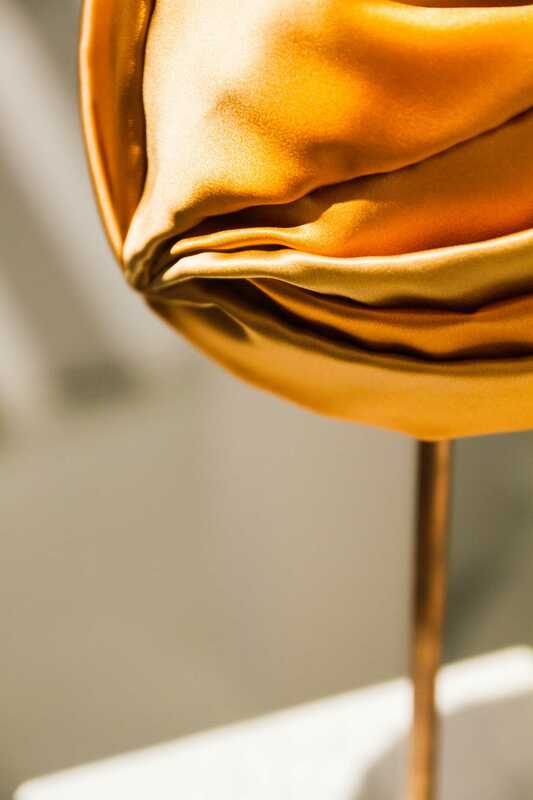 In this new and original declination of Agudio’s research, the three CHROME X turbans are wearable portraits: the details of the iris pigmentation are developed into a color palette, designed as garment which is now the genuine part of the genetic unicity of the person. The CHROME X turban is the ‘third eye’ on our head, which provides perception beyond ordinary sight, tool of potential identities to share. During Woman Fashion Week, CHROME X was presented at MEGA project space in Milan, on September 22nd, 23rd and 24th 2017. Flapper run a collaboration with the Italian designer Giuseppe Di Morabito. 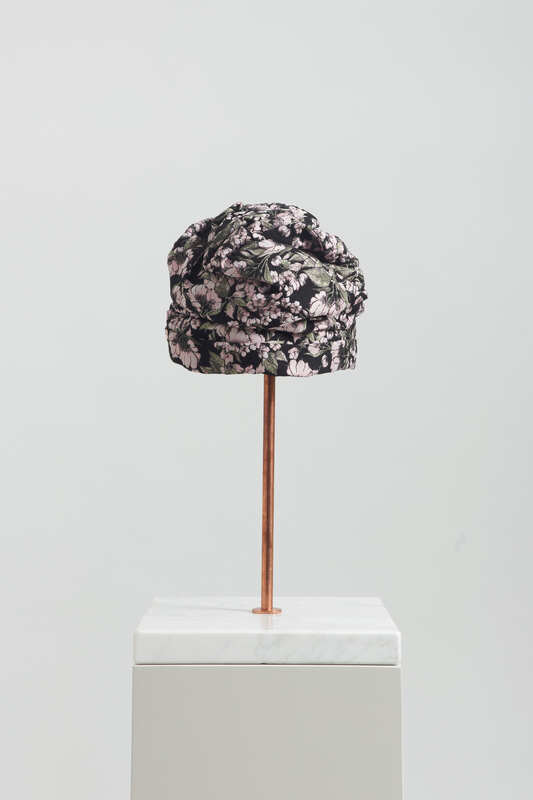 For this project three different jacquard fabrics have been used in order to create three different models: a headband, a turban and a reimagining of the classic aviator hat. Flapper and Maison Emanuel Ungaro announce their collaboration for the creation of a selection of turbans that complete the outfits of the prêt-à-porter resort collection 2018 of Emanuel Ungaro. The Flapper pour Emanuel Ungaro Resort 2018 collection is composed by four turbans that recall the prêt-à-porter collection materials. Created in 2013 by Genevieve Xhaet, FLAPPER is a women’s accessories brand that fuses tailored elegance with contemporary taste. For the Emanuel Ungaro collection Flapper takes inspiration from the Emanuel Ungaro prêt-à-porter collection designed by the new creative director, Marco Colagrossi, who presents his first collection for Emanuel Ungaro in June 2017. 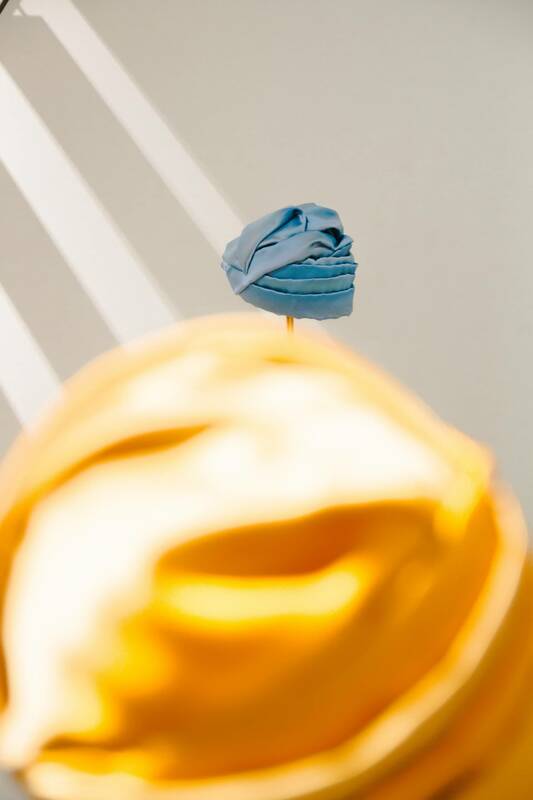 Lined in pink crepe de chine, turbans are realized with fabrics and embroidery of clothing and are handmade respecting the values and the artisanal know how of Made in Italy.